Blisteringly fast and highly-manoeuvrable, Euro Inflatables' first jet-unit production model is a handful of high-octane energy. It's a general purpose boat with a huge fun factor, but should be particular appealing to dive charter operators. Lawrence Schaffler reports. Euro Inflatables - based on Auckland's North Shore - began manufacturing performance inflatables more than five years ago after extensive R&D in hull and tube design. Until now, its line-up has comprised a variety of models in three ranges: the alloy-hulled Tuffy (3.5-5.3m) and Elite Range Series (4.2-5.3m), and those with fibreglass hulls (5.4-5.8m). All models are equipped with heavy-duty, multi-compartment tubes (welded polyurethane, 500mm in diameter), and have a reputation for excellent stability and plenty of usable floor area. The tough hulls also promote the vessels as robust, general purpose runabouts, ideal for mooching around reefs and running up on to a beach. 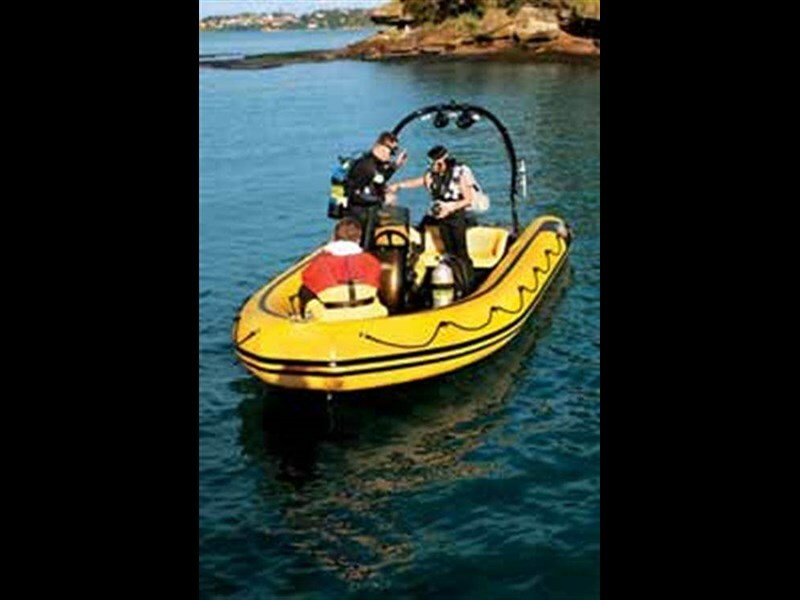 With generous space, they're particularly popular dive boats. The new, 5.9m Jet Raider will extend that appeal. 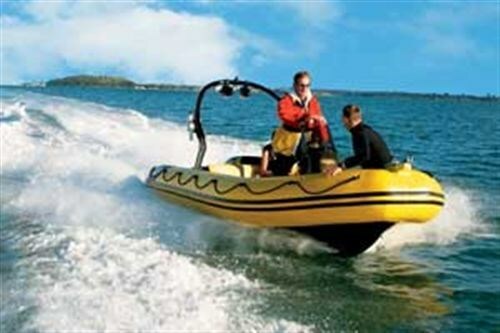 Sporting Euro's bright yellow and black livery, the streamlined "nacelle" engine cover creates a very sleek inflatable - it looks like a jet ski on steroids. Throw in the "star wars" sound system, the futuristic wakeboard arch and the gleaming instrument console - well, it's a good-looking package, with performance to match. Virtually identical to the company's existing top-of-the-line Pro Series III, the Jet Raider's only difference is the transom that's been remodeled to accommodate the 210hp Mercruiser V6 and jet unit. As suggested, the nacelle covering the power plant provides a far "sleeker" profile than the outboard-equipped boats. The more significant difference to the outboard model, however, is in the performance. Acceleration is eye-wateringly fast, and like a jet ski, this unit is happy to be thrown into tight spins. The stomach-churning flips are encouraged by a feather-light steering system (push-pull cable) that uses less than a full rotation lock to lock. With the fine-entry hull and the big tubes, however, the boat remains beautifully stable and surprisingly dry. She's a spirited beast but a quick confidence-booster, and after a few minutes even sedate, conservative drivers might be tempted to rip off their shirts, turn up the stereo's volume and perform a few do-nuts. For those interested in a range of boating activities rather than dedicated fishing, the Jet Raider offers a number of appealing features. A key one is weight: at only 720kg fully-fuelled, the boat is easily towed behind a medium-sized sedan. Low weight also facilitates launching and retrieving - especially when short-handed. The wake-board arch has an obvious role, but it's also equipped with rod-holders (helps to keep the cockpit free of clutter). Additional arch adornments include a pair of bass speakers that might be mistaken for afterburner thrusters. They're complemented by four conventional speakers set into the internal walls of the hull. The high-output sound system might seem incongruous on a vessel that leaves your ears tingling in the wind, but from what I've observed of modern "music", I guess lyrics and melody aren't really important. The beat is where it's at. Still, having said all that, the Mercruiser unit is surprisingly quiet, and conversation with the driver is possible without raising your voice too much. Divers will find the Jet Raider especially appealing. Rolling over the sides makes for easy entry, and there is a boarding platform aft on either side of the jet unit to help divers exit the water. A spacious interior (nearly 1.5m wide) should accommodate the gear for four or five divers easily. Perhaps more significantly, the vessel's speed allows divers to get to their favourite destinations more quickly, and its maneuverability and shallow draught (290mm at rest) provides access to awkward dive/crayfishing spots. The wake-board arch also carries three spotlights - useful for those into night dives. Inflatables are typically short on storage space, but the Jet Raider doesn't do too badly. While large items such as wake-boards, skis and fishing rods can be stowed on the arch, there are numerous options for additional storage. There is a sizeable locker up front under the bow seat, for example (it also hides the anchor locker). A central locker built into the cockpit floor will easily accommodate a couple of dive tanks. More storage is built into the centre console, under the seat and under the three-abreast rear seat. Immediately aft, built into the seat's backrest, are two water-tight lockers for wallets, keys, glasses and other small, personal effects. Another dry storage locker is built into the centre console. As with the entire Euro range, the Jet Raider is available in a variety of cockpit configurations. Our boat was fitted with a centre (driver astride) seat, console and windscreen. Alternative options include a single pedestal seat, with another seat attached to the front of the console, or side-by-side seating. The console can also be fitted with a bimini. For the style conscious owner, Euro Inflatables can also incorporate your towing vehicle's colours into the Jet Raider's console and engine nacelle. The Jet Raider's sleek, sporty exterior is complemented internally by a heavy-duty black carpet on the cockpit floor, and padded vinyl upholstery. 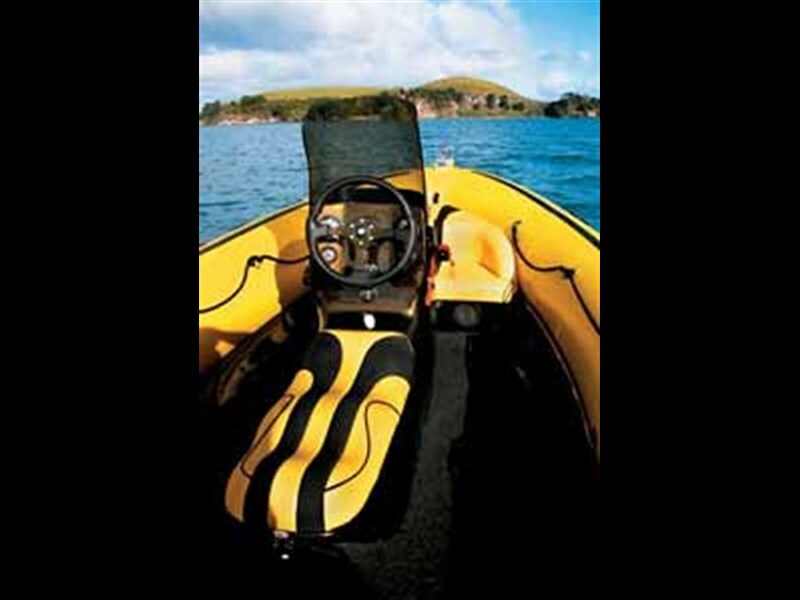 With the single bow seat, the three-abreast seat aft and the broad tubes, the boat should cater for six or seven passengers. Tube-seated passengers will be pleased with the heavy-duty grab ropes running the length of the vessel - especially if (when) the driver starts "experimenting". A 75-litre built in stainless steel fuel tanks nestles below the cockpit floor, with a separate 25-litre reserve tank under the centre console. Instrumentation in the console is standard Mercury, all set behind a moulded steering wheel. 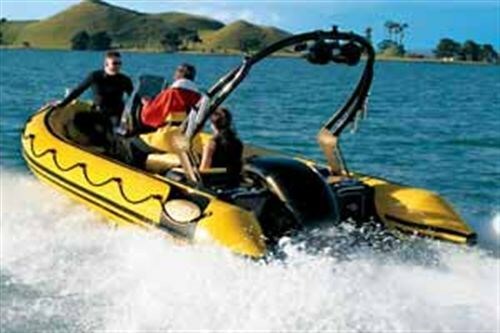 We put the Jet Raider through its paces in relatively benign conditions on Auckland's Hauraki Gulf. It's an exciting, fun boat to drive that thrived in the mild seas. I'd be interesting to see how it handles in heavier seas with a bigger chop. One thing's for sure: with low weight and all that horsepower, there's no doubt it's able to power out of harm's way. The boat has a reported top speed of around 55mph. We cruised around in comfort at 40mph - and getting to that speed is accomplished in seconds. I could see the Jet Raider as a classy workhorse at a tropical resort, used for skiing, wakeboarding, diving and fishing. 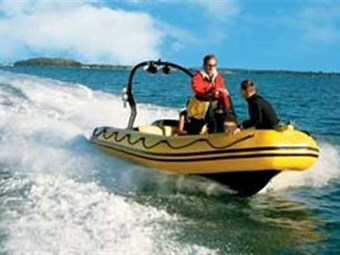 I could also see it used as a police chase boat - very fast, nippy and manoeuvrable - and with that shallow draught - able to go anywhere (Euro Inflatables vessels have U.S coastguard certification). We didn't listen to any music during our time on the boat, but if you're that way inclined, it's easy to imagine rocketing out to your favourite dive or fishing destination - accompanied by Deep Purple's Smoke on the Water - and believe that's all nearby boaties will see as you whistle by.